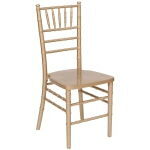 There is a certain elegance that only Chiavari chairs can add. Chiavari chairs bring a new level of style and sophistication to anniversaries, birthdays, weddings, and any event. Comes with cushion. Stackable to 7 chairs high. * Please call us for any questions on our chair ballroom gold/ivoryseat rentals in Boston, Somerville, Brookline, Cambridge, Malden, and Everett.